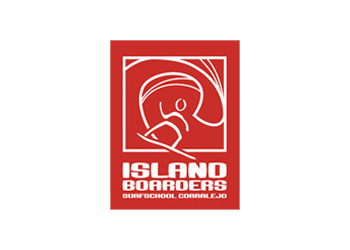 "At the beach the group is arranged into a semi circle where they will undergo a surfing specific warm up and safety brief, where all students are made aware of the lesson plan, dangers and all the signals/commands used by the instructors. On the beach all parties are then introduced to the prone section of the lesson, where they will be instructed on how to enter the water safely and ride waves from waist depth whilst lying down on the surfboard into the shore. This is followed by the "drop knee" position before attempting to stand and ride a wave. At all times you will be made aware of all the coaches signals, directions and encouraged to ask questions if you are not sure about anything, your enjoyment, care and safety is our main concern At the end of the session you will be dropped off at the hotel/ apartment after you have had a chance to review pictures/ videos that have been made of the days surfing" content taken from Island Boarders surf school official website.